Description: KCS SD50 712 only two years after delivery. Description: Kansas City Southern SD50 712 at Neosho, Missouri on December 8, 1992, Kodachrome by Chuck Zeiler. Description: Soon 712 will exchange dingy white for clean grey. 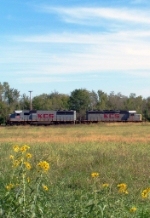 Description: KCS Southbound Local Freight Train passing through Neosho, Mo. Description: KCS Southbound Local Freight Train at Neosho, Mo. Description: EMD SD70ACe demo is the trailing unit on a northbound empty coal train on KCS's Heavener Sub. Description: KCS Eastbound Freight Train M- LCAR ( Lake Charles to Artesia ) departing KCS'S High Oak Yard in Jackson, Ms. Description: KCS Eastbound Freight Train M- LCAR ( Lake Charles to Artesia ) rumbles through Jackson, Ms. Description: KCS 712 is tied down at Dalby siding.The NB should recieve its crew soon.